An HD Matte powder in four shades that is available as refills only in post consumer resin clamshells. An empty compact can be purchased separately if desired. 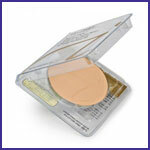 Translucent can be used on any skin, Lilac brightens sallow tones, Peach warms up pale skin and Dark is for ethnic skin tones or can be used as a bronzer. Formula eliminates shine, is ultra sheer, water-resistant and gives skin a flawless, smooth appearance.